Does ahimsa apply to spiders? Since childhood, I’ve had two reactions to spiders: (1) drop everything and flee; or (2) whack with lethal force. While rather sheepish later (once my heartbeat returns to normal), my reaction is instinctive and overwhelming. 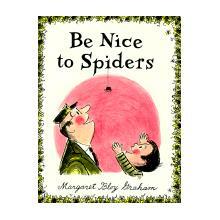 With no one to blame, I point to the children’s classic Be Nice to Spiders by Margaret Bloy Graham. Mom would frequently read this book to my sister (who’s just as certifiable) and me. Ironically, it was our favorite book. We’d giggle and shriek as the spiders appear (and multiply! ), breathlessly terrified and thrilled. Of course, our reaction (uh, overreaction) to spiders was established before we discovered the book. We simply used our repulsion-attraction to give story time an extra kick. Later, as an adult, I had to face real spiders alone: no more Dad to whisk them outside. Hence, my two-pronged approach began. Now, considering yoga philosophy and ahimsa (non-violence) in particular, I know that it’s wrong to smash a spider just for having eight legs (note: six-legged insects are somehow tolerable to me). If, as I wrote in my prior post, I am vegetarian because I cannot without qualms kill an animal, how can I nonchalantly destroy a spider? Hypocrisies (those little exceptions to our self-proclaimed rules) are more the rule than the exception. I admitted one of mine. What about you? What are your foibles and weaknesses? Where do you diverge from the yamas and niyamas? Finally a place to confess! In addition to being a yogi, I am a fly-fishing vegan. I catch and release, but the mental gymnastics I go through to convince myself that I’m not really hurting the fish are really just stunning in their hypocrisy. Ah, we can both feel light and free in our confessions… It’s the same with consuming milk and eggs. Even if “free-range,” cows and hens are not enjoying normal life. I have never gone fly fishing. All I know about fly fishing, I know from Norman Maclean’s A River Runs Through It, which made quite an impression on me. Regarding subsistence fishing: I view it as acceptable (part of the life cycle) if the fisherman sincerely acknowledges the fish’s life. This is different from buying scaled and gutted filets wrapped in cellophane at the supermarket. Before I found yoga, fly fishing was my favorite spiritual pursuit. I don’t know which has worried me more – my vegan friends finding out I fish or my fisherman friends finding out I’m a vegan. I’m like a double-agent. Also, if I’d known WordPress saved a copy of my picture somewhere, I wouldn’t have wasted the time coming up with the sneaky anonymous “Some Dude” handle. That’s funny. I dont’ mind spiders – unless they are big and hairy! I can usually scoop them up and take them outside. Flies, on the other hand, I cannot stand. Disgusting! I’ll have to think of my other “heather made rules” regarding ahimsa. I’m certain I have a few too! My major hypocrisy is junk food. I love feeling like I honor my body, but I’m pretty bad at doing it off the mat. I just love all sorts of bad food! I feel the judgment just typing it…! My mother told me that if you kill a spider it will rain. I grew up in Vancouver. I try not to kill spiders. Well, unless they bite me. I also kill mosquitoes that land on me. I’m pretty much over killing out of being startled. My confession: once, many years ago, some flying ants hatched from a nest underneath our back steps. I sprayed them with Raid, for no reason other than that they annoyed and repelled me. I can’t believe now that I felt that way. Twenty years after that I watched another hatch, with barn swallows swooping through the air with their beaks wide, scooping in the ants. I rejoice in a lot more of them than I used to.